Ranthambore Fort is among the only six forts, which find the place into World Heritage Site. It is located near the town of Sawai Madhopur and is an arduous fort. 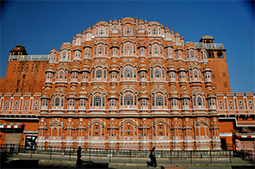 It is one of the key focal points and epicenters of historical development witnessed in erstwhile Rajasthan. The fort is known for the magnificence and heroism of Hammir Dev, who belonged to the Chauhan dynasty. The fort is located within the Ranthambore National Park that happened to be erstwhile hunting grounds of the Maharajahs of Jaipur, prior to independence of India. 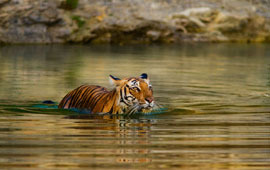 Ranthambore National Park is known for its tigers. The key tourist spots in and around Ranthambore are Kachida Valley, Surwal Lake, Malik Talao, Rajbagh Talao, Jogi Mahal, Padam Talao, Raj Bagh Ruins, Ranthambhore School of Art and Ganesha Temple. We will take you on one of the most adventurous tours of your life time - The Golden Triangle Tour of Ranthambore National Park and Tiger Reserve. 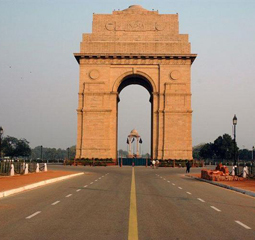 As soon as you land in Delhi, our representative will meet and greet you at airport and transfer you to hotel. Stay in the hotel for remaining day and relax. Enjoy the dinner in your serene hotel room and then retire. Have a delicious typical North Indian breakfast and prepare yourself for half-day sightseeing tour of Delhi. Start discovering the Old Delhi and you gradually begins to feel charm of great, wonderful and historic past. You will visit magnificent historic buildings such as Jama Masjid, Red Fort, Chandni Chowk and later visit Rajghat- which is mausoleum of the Father of the Nation. Return to your hotel and enjoy the lunch feast. Freshen up and pack your bag for road drive to Jaipur, the capital city of Rajasthan. As you reach the pink city, you will be transferred to a hotel. Our representative will meet and greet you there. Enjoy the dinner in your serene hotel room and then retire. Relish in a delicious typical Rajasthani breakfast. Prepare a light weight bag that you are going to carry as you prepare for an enjoyable elephant ride on to Amber Fort, which is approximately 10 to 12 kms. from Jaipur. The straight up drive will give you realistic feel of royalty. Later in the afternoon, go for the sightseeing tour, which would take you through City Palace Museum, Ram Niwas Garden, Birla Mandir, Hawa Mahal and royal astronomical observatory situated at Jantar Mantar. Later in the evening return to your hotel. Enjoy the dinner in your serene hotel room and then retire. Relish in a delicious typical Rajasthani breakfast in composed atmosphere of your hotel room. Make yourself ready to take a road drive to Ranthambore National Park in a luxury car. Ranthambore offers immensely heart rending place to tourists as they love to become one with the wild and rustic environment. 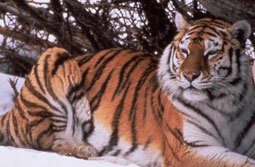 Ranthambore National Park was given the status of National Park in the year of 1955. As soon as you arrive in premises of Ranthambore National Park, you will be transferred to the pre-booked jungle resort. Make yourself feel comfortable. Unwind, and enjoy the dinner in resort. Stay overnight in the resort. Relish in a very specially prepared jungle type breakfast. A jeep safari will wait for you to take you on the trail of National Park. Relish the wilderness of the park and see an implausible animal species. Explore different types of wildlife and by evening you return to your resort. Unwind, and enjoy the dinner in resort. Stay overnight in the resort. Relish in a very specially prepared jungle type breakfast. Pack your bags and check out from jungle resort as you head towards Agra – the erstwhile Mughal capital, the foundation of which was laid down by Akbar the Great. This charismatic city is home to one of the Seven Wonders – The Taj Mahal. Enroute Agra, you take a brief halt at red sandstone city of Fatehpur Sikri, surrounding various notable structures such as Jama Masjid and the tomb of Salim Chisti. Once you arrive in Agra, you are transferred into your hotel. Unwind, and enjoy the dinner in hotel. Stay overnight in the hotel. Relish in a very specially prepared Mughlai breakfast. The chauffeur driven car awaits you for sightseeing tour of fascinating city of Agra. Catch the glimpse of The Taj Mahal, on your first halt. The marvelous sight of this fabulous Mughal structure would leave you far more than mesmerized in love thoughts. The monument was built by Shah Jahan in the memory of his wife. Located in vicinity of the Taj Mahal is the popular Agra Fort, which is now a World Heritage Site. Later in the evening you return to your hotel. Unwind, and enjoy the dinner in hotel. Stay overnight in the hotel. Relish in a very specially prepared Mughlai breakfast. Pack your bag and check out from the hotel. Chauffeur driven car awaits you as you prepare for road drive to New Delhi. 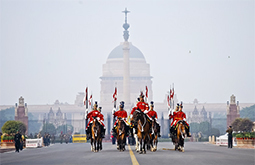 As you arrive in New Delhi, you will be transferred to your hotel. Fresh yourself and relax for a while. Afterwards, take a sightseeing tour of the city covering Humayun's Tomb, Qutab Minar, India Gate, Connaught Place, Akshardham Temple - famous as Swami Narayan Mandir, Lotus Temple and Laxmi Narayan Temple. Later in the evening you return to your hotel. Unwind, and enjoy the dinner in hotel. Stay overnight in the hotel. Check out from the hotel. You will be given a warm adieu. The chauffeured driven luxury car awaits you to drop you to International airport to catch your flight to forward destination.